Offering a laidback lifestyle and healthy sea breeze, seaside towns have long been the chosen destination for retirees wanting to enjoy a more relaxed pace of life. Brian James and his wife Joyce (both 77) are no exception. Keen to relocate somewhere closer to their daughter and her family but having enjoyed 25 years living on the Dorset coast, the couple were adamant that their next home offered the same easy access to the seaside, and were thrilled to find their idyllic location just eight miles from their daughter and less than a mile from the beach, at Bovis Homes' popular Milton Place development, in the pretty coastal village of Felpham, West Sussex. The couple fell in love with the location and contemporary style of their new four-bedroom house on Hedgerow Close, which is spacious and secure. Located on the edge of Felpham, the Milton Place development also offers a convenient lifestyle for the couple, with Chichester just a 20 minute drive away and the seaside town of Bognor Regis each just down the road - perfect for visiting their daughter, and the coastal lifestyle they were accustomed to. Brian comments: "When Joyce and I first visited the site, we loved the central location of the development, and were attracted by its modern style and the generous proportions of the rooms. The size of the property seemed more manageable for us than our previous home, and crucially, there was room for our friends and family to come and stay, which was really important considering we were moving to an area where we knew very few people." 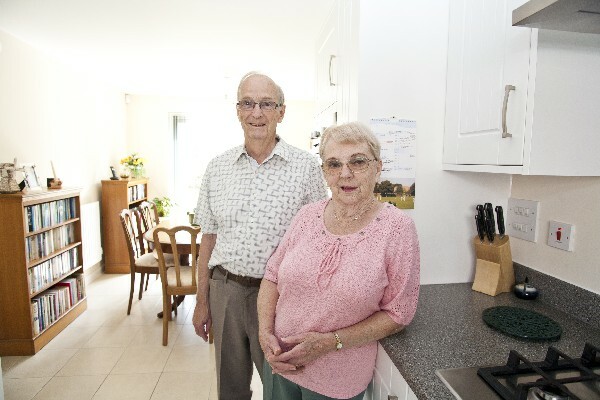 Since moving in to their new home in December 2011, Brian and Joyce have quickly settled in to their new life in Felpham, taking time to enjoy strolls along the beach and visiting the shops and cafes in the surrounding villages. The couple also attend ballroom dancing classes every week in nearby Worthing, and Brian intends to join a local photography club this summer. Brian says: "Swapping the Dorset coast for the Sussex seaside has been a great move for us and the rest of the family. The area has a lovely community-based atmosphere and we have already made lots of new friends." Aside from the location, another factor that attracted the James' to their home at Milton Place was the idea that they could buy off-plan. Whilst the couple felt the modern interior décor suited them, they were pleased they could make their home their own by choosing several of the finishes, including the flooring and tiling. The pair also really liked the fact that they could make use of Bovis' Part Exchange scheme, in which Bovis bought and sold their previous property for them, allowing them to move straight into their new home more quickly and easily. Brian comments: "We had never even considered using a part exchange scheme but it came as a welcome relief when we had difficulty selling our former home. The fact that we knew the sale of our property was all taken care of and made the whole moving process far less stressful. Bovis really came to our rescue at exactly the right time, and we could not have asked for better customer service or more helpful staff." Milton Place is an attractive development offering an excellent range of three, four and five bedroom family homes. Residents at the development enjoy great transport connections with the surrounding areas, with a regular express bus service running to Bognor Regis and Chichester from Felpham, and Bognor Regis railway station just two miles away, offering journeys of just under two hours in to London. Chris Roads, Sales Operations Director at Bovis Homes, comments: "We are so pleased to hear that Brian and Joyce have settled in so well to their new life in Felpham and are thrilled that through our Part Exchange scheme we were able to help them relocate here both more quickly and easily. The area offers a strong sense of community spirit and neighbourliness, and the development's proximity to the coast makes it a highly desirable location. We have already experienced a great deal of interest at the site and look forward to welcoming more new residents to the area in the future."